Writing with Stick Mark Boom! 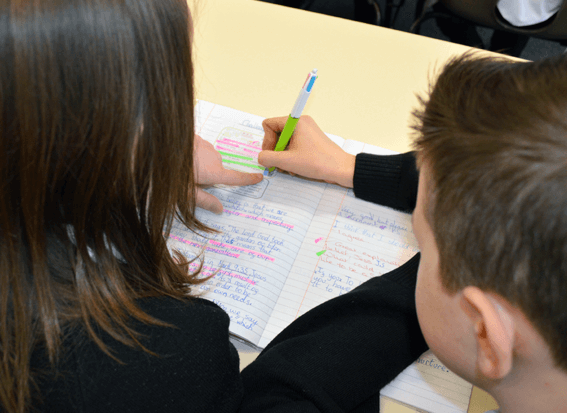 The SMB Writing approach is based on explicit success criteria (or ‘Steps to Success’) matched to the age related expectations for each text type under the new National Curriculum for English. In order to ensure progression across the Key Stages (for KS1, Lower KS2 and Upper KS2) there are three or four differentiated stickers matching the objectives for those age ranges. KS1 (C): Covering Year 1 ARE: Each sticker has an oral, vocabulary based and written success criteria. Children have the opportunity to self and peer assess by colouring the circles (red, yellow or green), or drawing smiley faces. KS1 (B): Covering Year 2 ARE: Each sticker has some of the ARE for Year 2. These could be used for a lower/middle attaining child in Year 2. Children are introduced to the ‘Blue for Self’ and ‘Purple for Peer’ approach to self and peer assessment. Children tick (achieved), or cross (not achieved), next to each of the success criteria, following a lesson. KS1 (A): Covering Year 2 ARE: Each sticker contains the success criteria a child would need to meet by the end of Year 2 in order to achieve ARE for that text type. 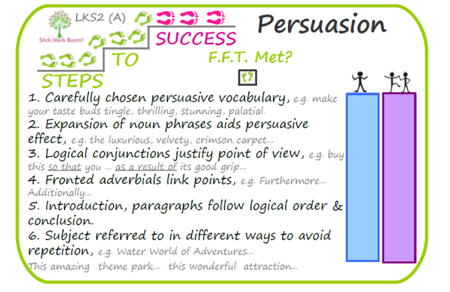 The success criteria are a mix of vocabulary, grammar and punctuation criteria as appropriate. Self and peer assessment should be embedded by this stage. LKS2 (C): Each sticker contains most of the success criteria for Year 3 ARE. It is generally assumed that children are secure with Year 2 ARE, therefore these will not be included, unless the same criteria is appropriate, but at a higher level, e.g. 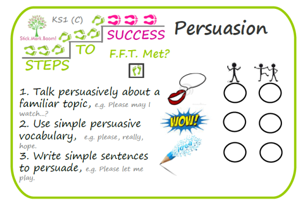 ‘persuasive vocabulary’ is a key feature of persuasive writing at KS1 and KS2. However, the difference in expectation is indicated by the examples given. 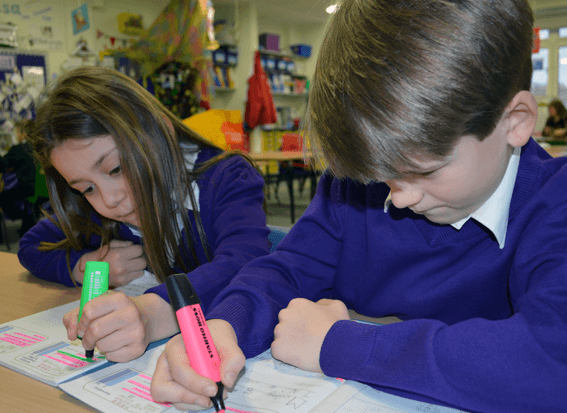 It is assumed that self and peer assessment are completely embedded throughout KS2 and that children are using their SMB pens to edit and improve their writing. LKS2 (B): Each sticker contains some of the success criteria for Year 4 ARE. LKS2 (A): Each sticker contains the success criteria needed to meet Year 4 ARE. UKS2 (C): Each sticker contains most of the success criteria for Year 5 ARE. 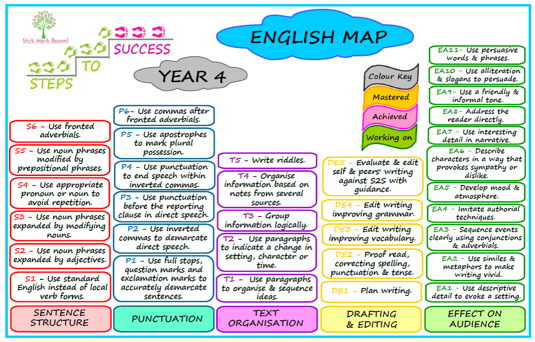 UKS2 (B): Each sticker contains the success criteria for Year 5 ARE and some of the Year 6 ARE. 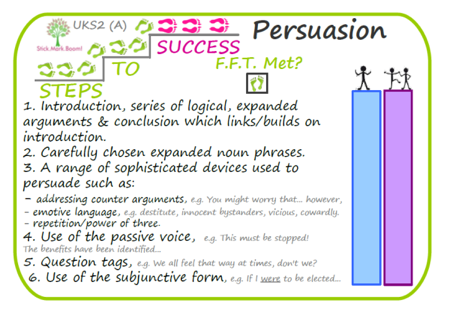 UKS2 (A): Each sticker contains the success criteria needed to meet Year 6 ARE. Below you can view example ‘S2S’ stickers showing progression across the Persuasion strand, along with supporting Magpie Nests. 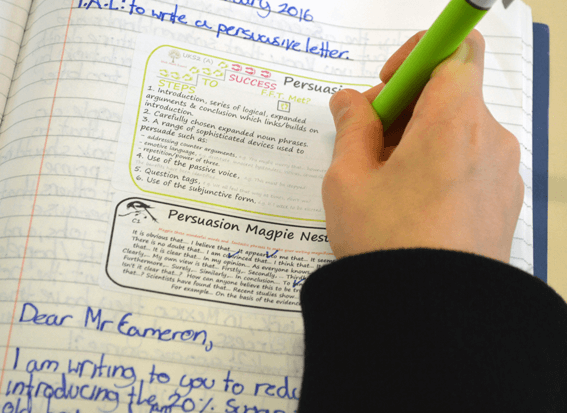 The extensive range of ‘S2S’ and ‘Magpie Nests’ aids differentiation and the personalisation of learning. We have recently released our 2016 KS2 ITAF (example below) and are offering these to schools free of charge. If you would like to receive an ITAF pack, please fill in the ‘Free Sticker Request’ form on our homepage. 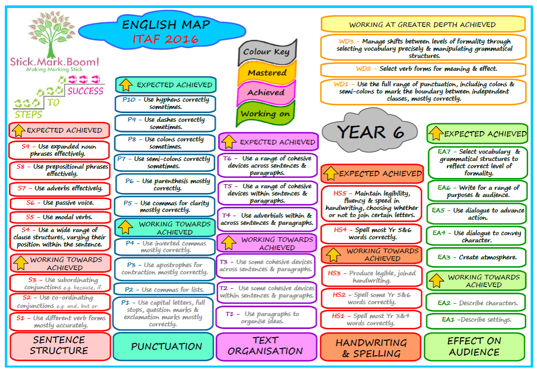 Year 6 ‘Interim Teacher Assessment Framework’ sticker (ITAF), with tiered targets to help teachers assess writing for the 2016 Assessments.